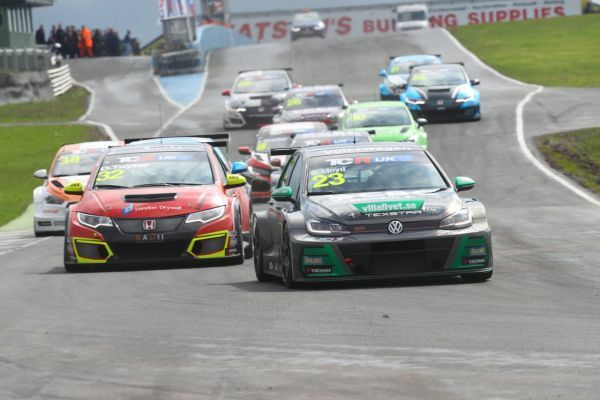 Daniel Lloyd continued his dream start to the TCR UK Series with another double victory at Knockhill. The WestCoast Racing driver has pocketed the maximum of points in the two events held so far with two pole positions and four race wins. This meant that Lloyd left Scotland with a 66-point lead over his teammate Andreas Bäckman in second, with Pyro Motorsport’s Oliver Taylor a further seven points behind in third. Lloyd put in a flawless drive to win the opening race, as Taylor and series newcomer Josh Price completed the podium after a thrilling scrap. Lloyd started from the pole and never looked back. In the first part of the race Aiden Moffat’s Alfa Romeo Giulietta was chasing the leader, but retired at the mid-point of the race with a driveshaft failure. After a safety car period, Andreas Bäckman made an error and handed second to Taylor; with five laps to run they made contact and this helped Price to move into second. In Race 2, Sean Walkinshaw started on pole, but Lewis Kent got an even stronger start from the second row and took the lead after a slight contact. Price got past Walkinshaw for second on lap four and then benefited from a Kent's mistake to take the lead. But Lloyd had been making steady progress, moving up to sixth by the end of the first lap and into second by lap eight. On lap 11 he overtook Price for the lead with a clean pass. Price settled for second, ahead of Walkinshaw in third and Darelle Wilson fourth, with the Vauxhall Astra. The TCR UK will be back into action at Brands Hatch on 2/3 June.